In 2013 Urs Fischer filled MOCA's Geffen Contemporary with hundreds of unfired clay sculptures — plants, characters figures and animals — ranging from cartoony to realistic renditions in varying sizes. In 2007, he tore up the floor, digging a deep ditch that extended across the floor of Gavin Brown Enterprise in New York. For “Images,” his current show, Fischer set out to reproduce myriad qualities of light. His originals, created on an iPad, were subsequently transformed into large-scale silkscreens on aluminum panels. The idea is to simulate the reflective surface and glow of the computer screen. At first glance the images appear to be painted, but in fact they are screen printed ink. Fischer's subject matter is invented, not observed. It ranges from the representational and the surreal to the abstract. He creates colorful sunsets with cloud filled skies as well dramatically lit interior spaces, many with artwork hanging on the walls. 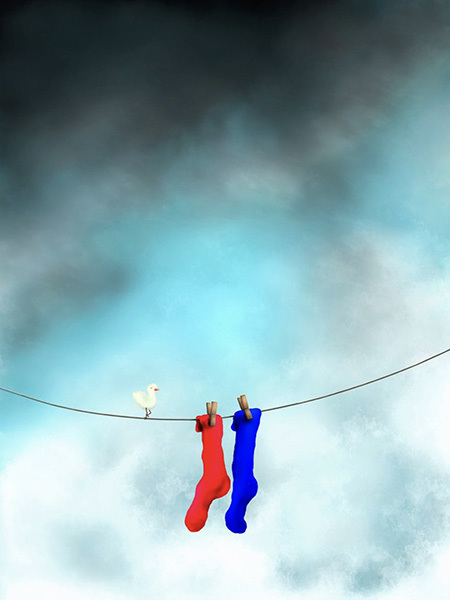 He also presents fantastical depictions, as in “2 Socks,” an image of a small white bird sharing space on a clothesline with a red sock and a blue sock. In “Blurrd” a yellow bird is attached to a twig that is magically floating in an ominous gray sky. Juxtaposed with more than thirty large-scale works are numerous small-scale floor-based cast bronze sculptures. These are quite charming, but amount to curiosities geared to elicit smiles. “Light” is a child-like rendering of a snowman positioned under a LED lit palm tree. Maybe is a motorized cast resin and silicone snail about six inches long, that slowly moves across the gallery floor, trailing a minimal but gelatinous residue. On the floor by the gallery entrance sits “Hi! I'm new here.” Only perhaps three inches tall, it is a sculpture of a small ambiguous creature hatching from an egg. Fischer's current works have the appeal and spontaneity of emojis. While there is a sophistication to their production, they are created to evoke memories and to inspire us to appreciate that which might be overlooked in their surroundings — like the way light illuminates a wall. These pieces bring together what does and could exist: they may just be musings, but the mind behind them is consistently inventive.